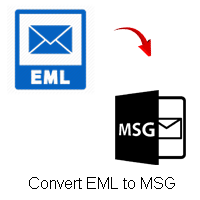 Simplified Software for EML to MSG Conversion with all properties of EML email messages. 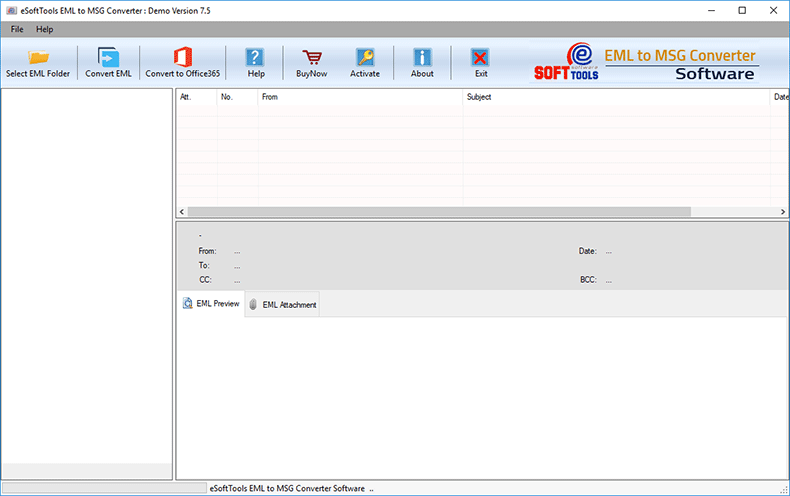 eSoftTools EML to MSG Converter Software is an most popular EML conversion software which helps to bulk convert eml to msg file without alteration of any eml properties. EML files generally created by n-number of email clients like Outlook Express, Thunderbird, Live Mail, Windows Mail etc.. and when you need to switch on MS Outlook then eSoftTools EML to MSG Conversion is best suitable software for you. This EML 2 MSG tool works greatly on bulk eml file conversion at time and transfer eml file to msg with attachments and all email properties. Batch conversion: Operate bulk Conversion of EML to MSG file. Software fully intact EML formatting and its properties during EML to MSG Conversion. The resultant MSG from EML file preserved original attachments as they are in EML file. No size limitation: Convert unlimited EML files because there are no any size limitation on EML file to load and export eml to msg files. Fully Safe & Secure: The software 100% secure and preserve every EML email meta data during eml 2 msg export. Preview each EML file in smart display panel before actual eml to msg migration. Supports to convert EML files from various email clients to MSG. Converted MSG files easily opened by all editions of MS Outlook including Outlook 2019 and all its below editions. A best way to convert EML file to MSG file! Without any break or interruption, export EML file to MSG file (Single or Bulk Conversion) process. The EML to MSG export tool has the ability to easily read & convert EML to MSG file with each and every information i.e- EML file header information, complete email body & EML attachments. eSoftTools EML to MSG Converter tool always performs excellent job on exporting EML file and preserve eml message properties during conversion into MSG file. The output MSG file format is used to store single email message of MS Outlook. Software fully capable to handle bulk eml conversion at time and allowed you to convert as many EML files as you want and successfully migrate EML to MSG file and keep maintains folder hierarchy of EML folders for better understanding. The software helps to easily switch from EML supported email client to Outlook by converting EML to MSG format. Converted MSG files will added to Outlook by dragging and dropping method. With the help of EML 2 MSG Conversion, users can export eml emails along with attachments and meta-data (to, cc, subject, size, date etc.) of all eml files to msg files. Software never loose single byte of information from EML files and easily preserves the original formatting of EML file to MSG. This convert eml to msg software has inbuilt concept to offers additional option to export eml to office365 with all details of email properties like To, Cc, Bcc, Subject, Date etc.. This feature is available at every license free-of-cost. The software provides you smart eml file preview section to clearly displays how and what information stored in EML file. This software also display your eml file attachments as well in proper orgnaized way. While export MSG from EML, the email attachments will remain embedded within converted MSG file. 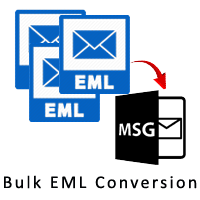 The EML to MSG converter tool will keep the attachments in its original format. While eml conversion to msg file, the software creates perfect report of each migration. You can see this conversion report of eml to msg conversion on export dialog. Simple and user friendly interface with detailed instruction in each step of operation help users to get easy-to-use platform to export EML 2 MSG file. This program works without any dependency of any third-party software like MS Outlook. So there no requirement of MS Outlook to perform best-to-best eml to msg export. See every steps of software work-flow and understand how to convert eml to msg mailbox without needed any third-party software..
Do i need to have MS Outlook installed, If i convert into MSG Outlook file? No, MS Outlook is NOT required for eml to msg conversion. Without Microsoft Outlook, user can easy to convert eml to msg file without any data losses. EML to MSG free tool also intact the original attachment during EML to MSG file conversion. I have Windows-8 and we used outlook express earlier and in Windows-8 Outlook Express cant work so what i can do? Outlook Express is not supported by Windows-8 but MS Outlook supported by all Windows OS.. You can convert your Outlook Express Emails to MSG file and import into Outlook. What can i get with demo version software? 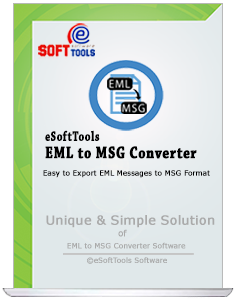 Demo version of EML to MSG Converter Software allow you to export 20 EML file to MSG file. What is the function of Batch EML conversion to MSG? With eSoftTools EML to MSG Conversion software, you can easy to perform batch EML conversion to MSF file. This means you can load folder having EML files and convert all of then simultaneously in a single conversion cycle. Yes, eSoftTools EML to MSG Export tool always gives the resultant MSG file in UNICODE format. The MSG file easy to open with every version of MS Outlook including Outlook 2016. Great teamwork! Full Positive staff! It was this excellence in quality that helped me maintain my email migration much easier and preserve EML attachmentâ€¦ Thank you! Again. I had very short time and around two thousands plus of emails that were exported by our client from a different-different sources and they want me to add these EML to his outlook profile. EML 2 MSG Converter swallowed them whole EML files without obstacle and I could load all on Outlook just minutes later. Fantastic job. I just want to say few lines of thankfulness to the whole team behind EML to MSG Converter. Before using i thought it may simple to use - but it really is - It does their conversion job in style! Its conversion goes very fast just like blinking eyes. Amazing work by your excellent team. Keep up the good work, guys.